Elegant and comprehensive blogging theme for WordPress. 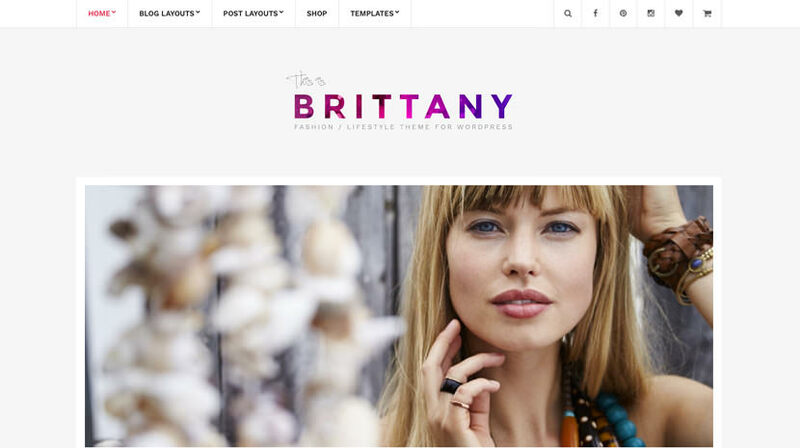 Specially made for lifestyle & fashion bloggers, Brittany shapes for your users a website to remember. Want to try a theme before deciding? We completely understand! That's why we provide you with a 15 day trial period. Check out the theme without commitment. This theme has the WooCommerce plugin pre-installed for you. If it is deactivated, you can go under Plugins > WooCommerce and activate it. Also go under WooCommerce > Settings and in the Products tab set the image sizes that best fit your shop under the Product Image Sizes section, in case you need different values than the theme sets by default. Once done click the Publish/Update button. 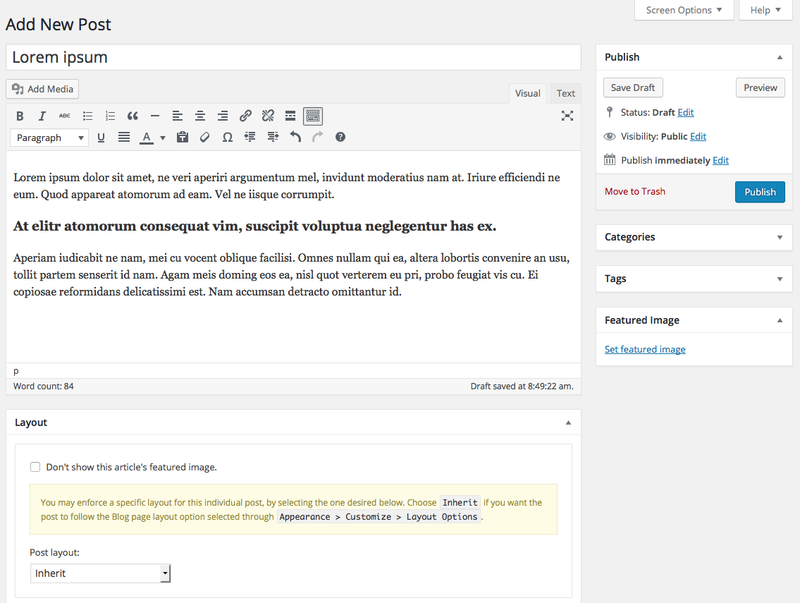 All theme customization is done via the WordPress’s built in Customizer. If you haven’t used it or want to learn more about it, please read this article. TIP: Any changes you make in the tabs below will be previewed live on the site which appears in the right side of the screen. However to save these changes you need to click the Save & Publish button on the top of the bar. If you have made a change but the button is grayed out (for example changed the font size of a heading), move the cursor outside the input box, to the next input box. The button should be clickable again. Toggle the sticky menu, social icons and inline logo. 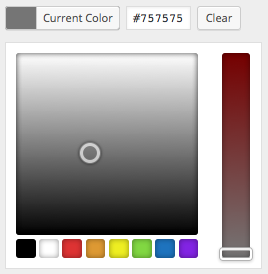 Additionally you can customize the header colors. Here you can create and assign menus to the theme. The theme features one menu location, the main menu. To learn more about menu creation, check out the Codex’s menu user guide. Here you can define the layouts of the blog listing and single post, set the blog columns, modify the length of the automatic excerpt, toggle the excerpt display in listings or select between numbered and older/newer pagination. In this tab you can toggle the appearance of the slider, select a source post category to display on it, or specific posts via their IDs. You can also limit the number of posts that appear on the slider and modify slider timings. Finally you can select where you want the slider to appear. Through this tab you can add widgets to the theme’s sidebars. The theme features ten sidebars, the blog, pages, two homepage sidebars, an e-shop sidebar, the pre-footer Instagram one and four footer sidebars. Here you can fill in the URLs to your various social network profiles supported by the theme. You can display them in a sidebar by using the Theme – Social Icons widget. Here you can toggle various aspects of a single post, like the appearance of categories, tags, date, comments, social sharing etc. You can also set the default single post layout and change the related posts section title. Here you can customize the display of the signature and social sharing buttons on pages. Here you can edit the credits text. Use this tab to make the Home page your static front page so you can take advantage of the homepage template we created for you. In this tab we host the custom CSS panel. You can use it to insert styles for elements not covered by the rest of the tabs. You can also set the Google Analytics ID to get statistics on your site. The Widgetized Homepage with Full screen Slider template offers you a full screen slider that adapts to the screen size, with all homepage widgets below. The Widgetized Homepage template offers a slider with a fixed height and the same width as the rest of the content. The Widgetized Homepage with Full width Slider gives you a front page with a full width slider with fixed height. The template can be selected from the Page Attributes drop down. To create a contact page similar to the one on the theme’s demo, create a new page, name it Contact and use the Contact Form 7 plugin to help you create a contact form. Then paste the shortcode it provides in the page’s text editor, publish and you are done. Each widget has a text about its usage. The Theme – Latest Posts widget is the cornerstone on creating the various homepage layouts. It’s a highly versatile widget. Let’s take a look at how to use it. Add a title to the widget and select a post category to display on it (leaving the option empty will display posts from all categories). Underneath it, select whether you want your posts to appear at random (default is by date from newest to oldest) or not and how many posts you want to display on the widget. Finally set the number of columns your items will be displayed upon and select one of the thirteen available layouts. As mentioned above, if you don’t select a post category on the widget, it will display posts from all categories. It’s very easy to exclude some of them if you wish, by selecting them in the Categories to exclude latest posts from field. Don’t forget to click Save when you’re done. While all posts appearance & column combinations will work, the once suggested below will provide you the best visual result. TIP: These combinations work for the blog listing layout ( See layout options in the Customization section above) and the Items widget. If you chose not to import the default widgets, but want to recreate the homepage layout of the theme’s demo, you can achieve that too by following the instructions below. The homepage consists of the Slider area and the Homepage sidebar. The slider can be configured under Customize > Front Page Carousel. The size of the slider depends on the template you have selected for the Home page. Contact Form 7: Use this plugin to create a contact form, then copy the shortcode it gives you and paste it in the page that will serve as your contact page. WordPress Jetpack: You can use this to create a contact form instead of Contact Form 7, insert sharing buttons, create tiled galleries etc.